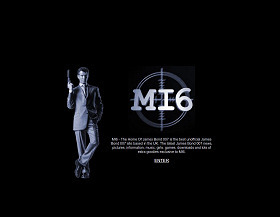 This month marks the 20th anniversary of the launch of MI6. 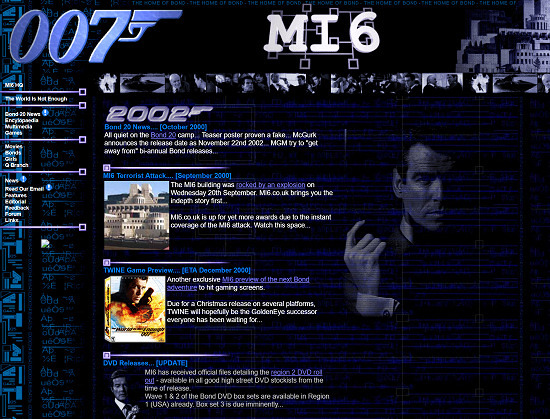 It is hard to believe that twenty years have flown by since the first version of the MI6 website was launched in February 1998. Pierce Brosnan's second outing as 007, 'Tomorrow Never Dies', was wrapping up its theatrical run. Yahoo, AOL, MSN, and Geocities were the most popular homepages for web surfers. Elsewhere, Bill Clinton was in his second term as US President and Tony Blair was just getting his feet under the desk of No. 10 in the UK. Early 'splash screens' of the website. James Bond's online presence back then was very different to what we enjoy now. The official website was only a handful of pages with low-resolution QuickTime clips to promote 'Tomorrow Never Dies.' In the initial years of digital coverage, a few websites emerged from the early Internet mist that would be instrumental in the first generation of Bond online. 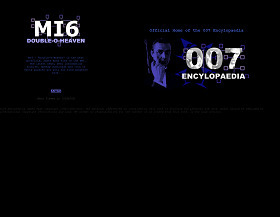 Along with MI6, websites such as H.M.S.S, Kiss Kiss Bang Bang (from the Ian Fleming Foundation), AJB007, 007 Forever, and Kimberly Last's James Bond site led the charge. All of those are long since defunct, although AJB lives on as a discussion forum and Bill Koenig's Spy Command blog emerged out of H.M.S.S. 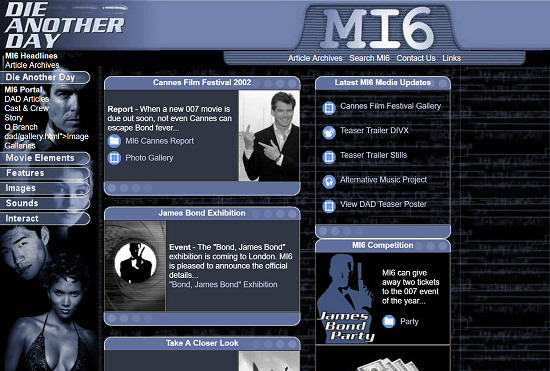 MI6 has undergone a few redesigns over the last 20 years and can be roughly broken into five eras. The first era comprised of a series of dark designs with static content. News was updated sporadically as the focus was an online encyclopedia of the films, characters, vehicles, gadgets, and locations. Very little information about the series was online at the time and the likes of Wikipedia was still years away. For a few years, this was the only real reference material about the Bond films online. Launched in the run-up to 'Die Another Day' the second design used dynamically generated pages for the first time, something now taken for granted by webmasters. 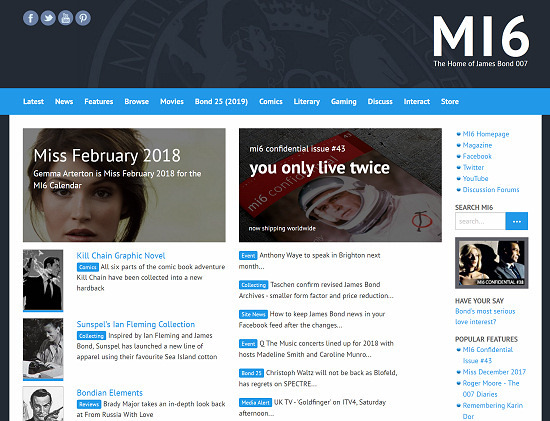 The second era launched a blue colour scheme in 2002 and featured dynamic content (something which nearly every website now takes for granted) and the news was published as it happened. It was the start of daily updates which would continue throughout the rest of MI6's run to date. This was the first time that a Bond film production ('Die Another Day') was covered in-depth every day from the first press rumours through release and everything in-between, and MI6 coverage of the latest happenings often popped up in newspapers and TV reports the following day. The third major change was in 2004 with a flip in contrast to a light design that was more inline with news and media websites of the time. Attention shifted further towards the latest breaking news and exclusive interviews, much like a newspaper. The timing could not have been better as the uncertainty of the future of the series was a topic of constant media speculation and peaked when MI6 revealed Daniel Craig as the new James Bond a day ahead of the official announcement. The day MI6 'broke the internet' when we announced Daniel Craig as the new James Bond a day ahead of any media or official release. A splash page had to be deployed for a week to load balance the servers due to high traffic. Just under a year after Daniel Craig made his debut in 'Casino Royale', MI6 took a giant leap from the online world and into a sister print publication - the opposite direction to everyone else and a risky proposition, it seemed. Launched in October 2007 as MI6 Declassified, and later renamed to MI6 Confidential after issue 8, it was and remains the only regularly published James Bond magazine in print reaching fans in over 45 countries. MI6 Confidential now releases five full-colour issues a year. The fourth design was the longest running style, lasting six years. With two Daniel Craig films wrapped, the fourth major design change launched in 2010 featuring a fresh combination of the familiar colour schemes and style that visitors had come accustom to over the years. 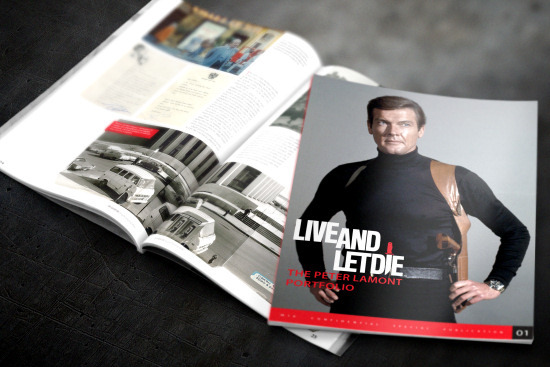 With no Bond film in active development, content was a blend of news and historical coverage. 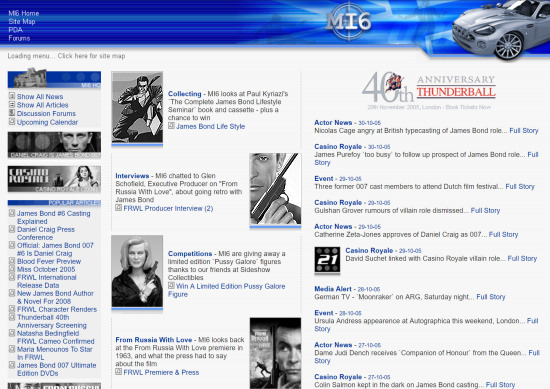 It was around this time that the stalwart James Bond websites started to disappear, their gap filled by general movie blog news websites that occasionally covered 007 with varying accuracy. 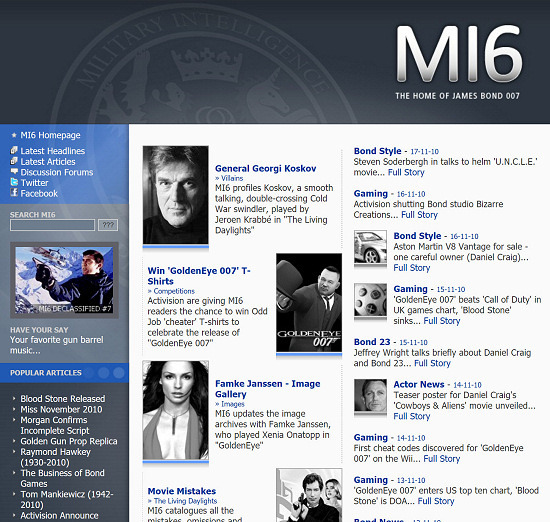 Along with the rebranding of the magazine, MI6 shifted to its current '.com' address in March 2011 and left behind the old '.co.uk' domain. The fifth and current design was launched in 2016 to better serve mobile readers and social media syndication. The future of the 007 franchise was more certain 20 years ago than it was today, although nobody knew back then what would be in store with Brosnan's unceremoniously leaving the franchise, MGM's bankruptcy and repeated financial troubles, Daniel Craig's controversial casting, and the 'new normal' of longer breaks between films. 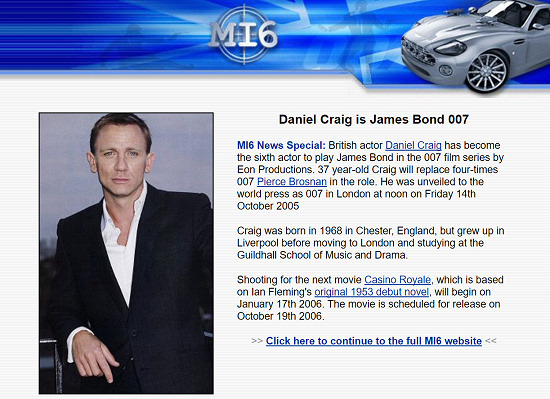 Whatever lies in store as we approach the fifth - and probably final - Daniel Craig outing, MI6 will be here to cover it. Over the course of this month, we will be revisiting the most popular and groundbreaking stories MI6 has covered over the past 20 years. Do you remember something that particularly stands out from the past 20 years of this website? If so, please shoot us a comment via Facebook or Twitter.